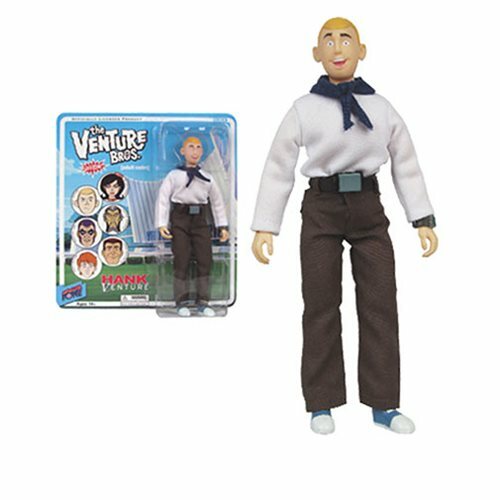 Fully articulated, 8-inch tall Hank Venture Action Figure! Bif Bang Pow! blasts off for action with this line of fully articulated, 8-inch tall action figures based on Adult Swim's all-the-rage animated series The Venture Bros. You'll find the most popular and recognizable characters from the show faithfully represented in real fabric clothing and a 1970s retro style that accurately portrays that distinctive action-comedy mix that has become synonymous with the TV series! Each figure comes individually carded in blister packaging. Limited edition of 3,000 pieces. As outgoing and adventurous as ever, Henry Allen "Hank" Venture is here without his twin-brother Dean, bringing the titular protagonist to your home as a fun-filled action figure you'll enjoy for years to come.